According to a new report from Lloyds TSB Student banking* more than one in four young people starting university this year will have to live with their parents to save money. This represents a 4% dip from 2007’s high of 31%, and a 5% increase when compared to numbers for 2006. A third of the 130,000** young people who will find themselves staying with their parents while they study say that they will not be able to afford to go to university unless they live at home, while 82% agree that living at home is a great way to save money. One in four said that living at home is an effective tool for managing their debt. However, 62% of those who are planning to stay at home admitted that if money wasn’t an issue, they would prefer to fly the nest sooner. Young people put their student finances high on the list of university concerns. 26% were worried about managing money while they are at university, while 13% admitted that this is the first time that they will be setting a budget and holding the purse strings. Economic uncertainty and the prospect of increasing university fees are taking their toll, with 65% of students saying it will be difficult to afford university if the cost of living continues to rise and 38% saying that soon the cost of going to university will outweigh the benefits of going at all. For the 66% of students-to-be who are planning to live away from home, 62% think that the financial implications are worth it for gaining their independence, while a quarter have no choice as they want to study at a far-away institution. Just 5% will be expecting their parents to foot the bill for their studies and 11% believe that they will be able to set a budget and make their finances work. The main reasons for choosing to live away from home are to be closer to their university (74%), to gain independence (66%) and for the social life (56%), with 22% admitting that they are itching to fly the nest. Catherine McGrath, director of current accounts, Lloyds TSB, commented: “Going to university isn’t just about getting good grades, it also has to make financial sense. The survey also revealed that many young people are making difficult choices in order to balance the books at university. 34% admitted that they will be taking more than one job over the summer break to build up their capital, while a quarter will have to hold down a job during term time to make ends meet. 15% will rely on work during the holidays to help boost their bank balance, while 8% said that they would prefer to rely on loans and an overdraft in order to focus on their studies. Lloyds TSB Bank plc Registered Office: 25 Gresham Street, London EC2V 7HN. Registered in England and Wales no. 2065. Known for being environmentally friendly and inspiring a love for nature, Check Gallery is always adding new check designs to enhance its collection. The “Zen Garden” design fits right into the current assortment. By portraying the beauty of some of nature’s finest flowers, this new design will encourage consumers to be more aware of their natural environments. On August 11, 2008, Check Gallery released the new “Zen Garden” check design through its website, www.checkgallery.com. 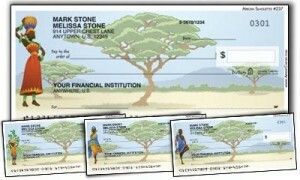 In four rotating scenes, a white background displays exotic Asian vegetation on these personal checks. Bamboos, Asian water lilies, bonsai trees, and bauhinia trees are all featured in vivid colors and intricate detail. The address labels illustrate these plants against a background of blue with a green border; the personal contact cards present the vivid, purple Asian water lily; and the checkbook cover portrays the beautiful pink flowers of the bauhinia tree as they cascade from the branches. Check Gallery promotes the well-being and beauty of nature. The addition of the new “Zen Garden” check design will once again introduce the magnificence of our surroundings and encourage people to protect them. Since its creation in 1993, Check Gallery has prided itself on being an environmentally friendly company. By printing all of its products on recycled paper, Check Gallery proves its love and respect for nature. Each and every design offered by the company fits uniquely into this theme. Visit the site today and see which nature-friendly design fits your interests! As the credit crunch hits the UK, Fairinvestment.co.uk, leading online comparison site, announces that prepaid credit cards are no longer just for people who have bad credit histories, and could be the answer to those who are looking for the functionality of a credit card but want to avoid the risk of debt. “A prepaid credit card offers a simple, effective and safe way of paying. You top up the card with money and then use it to pay for goods, safe in the knowledge that you can never go overdrawn or into debt,” explained Phil Alcock, credit card expert at Fairinvestment.co.uk. 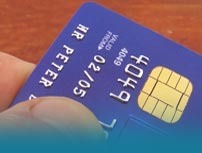 There are currently about 2.3 million prepaid credit card holders in the UK, and this figure appears set to keep on rising as people realise the benefits of a prepaid card – by 2010, the prepaid credit card market is estimated to be worth around £4billion with more than 7 million prepaid card holders*. Because prepaid credit cards offer the same functionality as a credit card but without the risk, they have generally been associated with people who have bad credit histories and who have found it difficult to get a normal credit card. Although prepaid credit cards still offer this valuable service, they are increasingly being used by people who could easily get a standard credit card but choose prepaid for their flexibility and convenience. Prepaid credit cards are a good method for making online payment, this is because the only money that is at risk is what is loaded onto the card. The Optimum Prepaid Master Card has been specifically aimed at people concerned about the security of online spending. Prepaid credit cards are also a very good budgeting tool – users can pick their limit, load it onto the card and that becomes their budget. It is for this reason that they have become very popular with parents who want to give their children financial independence but limit their spending power. “Parents looking for a way to educate their children to be responsible with their money find that prepaid cards provide an excellent teaching method because they give the child the chance to be independent and even purchase goods online, but there is a strict budget in place. This can be handy for everyday life, or perhaps if a child is going on a school trip where they need cash,” said Mr Alcock. Prepaid cards, which can be used all over the world, have also seen a hike in popularity as families begin to use them on holidays abroad to keep their holiday spending in check. The currently available prepaid credit cards are also highly convenient as they can be topped up at designated retailers, online, in banks, via BACs and then spent in store, online, at cash points and anywhere in the world with the Maestro acceptance mark. www.fairinvestment.co.uk, is an independent online finance portal, providing comparison tools, including a free prepaid credit card comparison service, personal finance news, reviews and information on a wide range of financial products and services, including insurance, credit cards, mortgages, loans, savings and investments. Quest CE the nationwide provider of continuing education and compliance solutions for financial services professionals, today announced it will be moving to new corporate headquarters. The move to new offices in Milwaukee’s Two Park Plaza will accommodate Quest CE’s current staff and make room for expansion to keep pace with the company’s vigorous growth. Quest CE’s new headquarters offers a modern and open layout. All combine to create a working environment that fosters creativity and the open exchange of ideas among Quest’s staff and between Quest and clients. Quest CE is a nationwide provider of continuing education and compliance courses to licensed professionals and financial planners. Each year Quest CE delivers over 150,000 continuing education courses either over the Internet or through live CE training. To find out more information about Quest’s Corporate Discounts and large volume orders go to the company web site at www.questce.com or call 877-593-3366. Amid worries about the reduced availability of credit, debt consolidation experts DebtAdvisersDirect.co.uk stress that lenders are still offering debt consolidation loans and other forms of credit. A spokesperson commented: “With inflation more than twice the Bank of England’s target, people in debt are particularly worried about stretching their household budget further and further, especially when talk of an economic slowdown is threatening to reduce many consumers’ income levels as well. When there simply isn’t enough money in the monthly budget, a debt consolidation loan or other debt solution could take the pressure off. The Survey provides a summary of what ‘bank and non-bank’ lenders have seen over the past three months, and what they expect for the coming three months. It reveals that lenders had reduced the availability of both secured and unsecured credit to individuals and expected ‘some additional reductions in credit availability over the next three months’. Looking ahead, however, lenders do anticipate a further reduction in the availability of secured credit. Even though they expect Q3’s reduction to be smaller (just over 20%), the cumulative effect could well make it harder for certain people to access the debt consolidation loans they need in the months ahead. http://debtadvisersdirect.co.uk helps people with financial difficulties, providing debt advice and tailor-made debt solutions. Commenting on the rising number of home repossessions, debt consolidation experts DebtAdvisersDirect.co.uk point out that IVAs (Individual Voluntary Arrangements) and other debt solutions could help people stay in their homes. Of the 45,000 repossessions expected by Council of Mortgage Lenders (CML) in 2008, there were 18,900 in the first half of the year. In the second half, therefore, the CML expects a further 26,000 or so. “As with any statistical forecast, this figure isn’t written in stone,” said a DebtAdvisersDirect.co.uk spokesperson. “Times are particularly tough for homeowners, but many people threatened with repossession may be able to resolve their situation by talking to their lender, and by taking steps to sort out their finances and free up enough money for their mortgage payments. “Different homeowners will, of course, need to adopt different tactics to avoid repossession. Some may just need to reduce their spending, while others may need to consider taking in a lodger, for example, or working longer hours. Some homeowners, however, are facing more serious debt problems. “At a certain point, the monthly debt repayments simply exceed the individual’s ability to keep up – there just isn’t enough money coming in to service the debts and cope with the ongoing bills. Once this happens, they find it’s almost impossible to pull themselves out of debt without professional help. The important thing is to get in touch with a debt specialist as soon as possible, and find out what they can do to help. www.debtadvisersdirect.co.uk helps people with financial difficulties, providing debt help & advice and tailor-made debt solutions. Artistic Checks constantly expands its creative collection to appeal to every customer’s unique taste. The release of the new “African Silhouettes,” designed by an in-house graphics team, is another way for Artistic Checks to diversify its check assortment. The design is certain to appeal to new and existing customers alike. On August 11, 2008, Artistic Checks launched “African Silhouettes” through its website, www.artisticchecks.com. In four rotating scenes, an African Acacia tree stands in the middle of the safari and acts as the background for these personal checks. Also on the checks, four different figures of African natives stand in colorful traditional garb with tools, baskets, and water jugs needed to perform daily tasks. The address labels, which are self-adhesive, feature a rotating sequence identical to the checks. While the personal contact cards feature a native child, the checkbook cover portrays a hunter as well as a mother and child on their way to gather crops with baskets atop their heads. All three stand tall in the protective shade of the Acacia tree. Artistic Checks has always offered creative and unique designs for checks and check accessories sold direct to consumers. The addition of the new “African Silhouettes” provides an ethnic option for all interested customers. This check design brings a fresh and distinct feel to Artistic Checks that will attract new customers and peak the interests of existing ones. Since its inception in 1998, Artistic Checks has been offering imaginative designs. Consumers looking for works of art to portray on their banking accessories should look no further than Artistic Checks. A visit to the site is sure to find you a masterpiece you can fall in love with! Responding to a study suggesting that a quarter of British adults have shelved their holiday plans to ease the strain of the credit crunch on their finances, debt management company Gregory Pennington (www.gregorypennington.com) have advised other people struggling with their finances to consider following suit and not risk getting into debt this summer. The study from CreditExpert.co.uk, the online credit monitoring service from Experian, showed that 43% of those questioned were worried about the impact of a holiday on their finances, yet only 24% have changed their plans. The study also claimed that 2.8 million British adults will get into debt in order to fund holidays this year – twice as many as this time last year. A spokesperson for Gregory Pennington commented: “It’s encouraging that many people are considering changing their plans with regards to holidays this year, although it’s still a concern that so many people are still spending beyond their means. Of the people attempting to cut back on holiday debts, it was revealed that 19 per cent would be sharing with family or friends in an attempt to cut costs. This figure rises to 37 per cent in the 18-24 age group. The spokesperson commented: “Sharing is a good way of minimising holiday debts this summer, and some people may be able to avoid getting into debt entirely this way. Certainly, if you are still intending on going on holiday, we advise people to cut costs wherever possible, unless you are completely sure you can afford it. The spokesperson went on to point out how easy it is to get into debt unintentionally. “Many people book holidays well in advance, up to a year in some cases. Much of this is done on credit, under the belief that they will be able to save up enough money in that time to cover the holiday. “But the pressures of the credit crunch and rising costs of living mean that many people may be finding it much harder to pay for their holidays than they anticipated. If this happens, it doesn’t take long before the interest begins to add up and the debts could become unmanageable if they are not taken care of quickly. Gregory Pennington (http://www.gregorypennington.com/) are a financial solutions company based in Salford Quays, Manchester. The company specialises in a range of financial services, including mortgages, loans, debt help and advice (including debt management plans, IVAs, and debt consolidation). DebtAdvisersDirect.co.uk warn that recent large increases in the price of gas could seriously affect people in debt. Following recent increases in the price of gas, debt consolidation experts DebtAdvisersDirect.co.uk warned of the probable impact on those already struggling to cope with higher living costs, economic uncertainty and record levels of personal debt. Shortly after EDF Energy’s announcement of its decision to raise gas prices by 22%, British Gas owner Centrica announced an increase which would see the average gas bill rise by 35%, taking a ‘standard’ annual £650 bill up to almost £900. Despite British Gas’ reassurance that the increase would be postponed until April for the 340,000 customers who qualify for its ‘Essentials’ tariff, the effect on millions of other customers will be immediate. “With so many demands on their budget, consumers are facing some tough decisions,” the DebtAdvisersDirect.co.uk spokesperson continued. “They may feel forced to ‘juggle’ their debts using credit cards, or even to neglect some bills so they can pay others. In many cases, the right debt advice can help people cope with the extra strain on their finances: “Some people may be able to free up the necessary extra funds by learning to budget more effectively, or by renegotiating payments to their creditors. For others, however, no amount of debt advice will be enough – if their budgets are already stretched to the limit, they may need to look into professional debt solutions, such as a debt management plan or debt consolidation loan. “In today’s economic climate, of course, the kinds of debt help available may be limited, as problems in today’s credit market are keeping some people from accessing the debt consolidation loans that could help them regain control of their finances. In cases like this, an alternative debt solution may be more appropriate.